Wild-caught Salmon topped with honey dijon sauce and cracker crumbs. For weeknights or date nights, our oven-ready tray makes it easy to bake a gourmet meal. We top our wild-caught Salmon with a honey dijon mustard sauce and a crispy cracker crumb blend for a taste you just might fall in love with—all you have to do is peel & bake. *FULLY COOKED FISH IS 145°F OR HIGHER AT THE THICKEST PART OF FILLET, FLAKES EASILY WITH FORK AND IS OPAQUE. 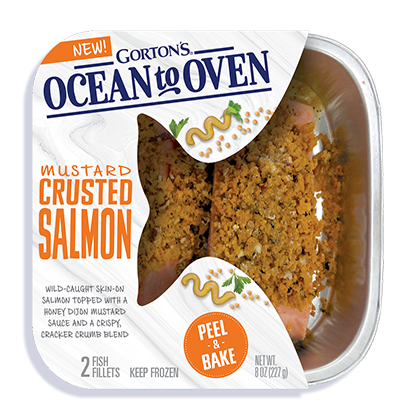 INGREDIENTS: Salmon, wheat flour, sugar, less than 2% of: canola oil, water, Dijon mustard (vinegar, mustard seed, salt, white wine, citric acid, tartaric acid, spices), brown sugar, soybean oil, honey, salt, egg yolk powder, rice vinegar, corn starch, yeast, maltodextrin, dehydrated onion, yellow corn flour, honey solids, colored with paprika and turmeric extracts, dehydrated roasted garlic, baking powder (baking soda, disodium pyrophosphate), spices, horseradish, parsley, acacia gum, vinegar, citric acid, natural flavor. Produced in a facility that processes milk, tree nuts and shellfish.